Just because you like waking up in the middle of a forest to the sound of birds chirping or bears sniffing for food doesn’t mean you should shiver yourself to sleep or have to wake up with a stiff back. If you want to enjoy a good night’s sleep while having adequate protection from the cold and precipitation, Sleepingo offers an affordable double sleeping bag that meets all these requirements. Sleepingo Double Sleeping Bag offers the best of both worlds. It fits and protects two people at a price comparable to that of single sleeping bags, and it can also be split into two singles if the occasion calls for it. The double sleeping bag from Sleepingo is made for very specific campers. It’s a great piece of camping equipment for couples who enjoy outdoor excursions and for families with small children. If you’re none of the above, it will still pique your interest if you enjoy traveling light and having plenty of room in your sleeping bag. The 30° F temperature rating of the Sleepingo double sleeping bag makes it suitable for at least three seasons. Of course, depending on your location, it may serve you for the whole year or just a few months, so do keep that in mind when choosing sleeping bags based on season ratings. What you get from it is a comfy sleeping area of 87” in length and 59” in width. The zipper surrounds the sleeping bag entirely which means you can very well put two of them together and have a massive slumber party for enthusiastic outdoor kids. Considering its size and affordable price tag, it’s nice to see that Sleepingo managed to sneak in waterproofing as well into the design. The inside features 210-thread-count fabric which adds to the level of comfort. It’s not a 100% cotton interior, but it is very breathable nonetheless. The waterproof polyester keeps you safe from the occasional spill, or from light showers if you simply must sleep under an open sky.The travel pillows included are not anything spectacular, but they are comfortable enough. Considering that they also fit perfectly inside the sleeping bag, which you can then fold and put everything in the carry sack, they have zero impact on your packing efficiency and a massive impact on your comfort. The two key features of Sleepingo Double sleeping bag link to its adaptability. As already mentioned, the zipper goes all the way around which means you can connect it to another one and turn the double bag into a massive sleeping area. What could be even better? You can also turn the double sleeping bag into two single sleeping bags. It can get a bit tricky to work the zipper to take the whole thing apart, but it’s well worth the extra minutes of prepping if you don’t feel like snuggling or if you’re camping solo. When it comes to double sleeping bags, the choice can be more complicated than it looks on paper. For example, the Teton Sports Double-Wide Sleeping Bag offers better protection against the cold as it is rated to work down to 5° F. It is also slightly wider at 63 inches, but it does have two drawbacks.If you’re comparing the two, then Sleepingo Double Sleeping Bag is obviously more budget-friendly than the alternative. Moreover, the shape of Teton Sports model is narrower at the feet, which negates its extra width. With the 25° difference in temperature rating, Teton Sports is better at protection against the cold, but you could save a few bucks by going with Sleepingo and wearing an extra layer of clothing. Sleepingo Double sleeping bag is one of the most versatile sleeping bags we’ve had the privilege of reviewing. It doesn’t sacrifice comfort for protection and its queen-size dimensions can be split in half or made even larger. No longer do you have to buy two singles and put them together so that you can fit your entire family under one cover. 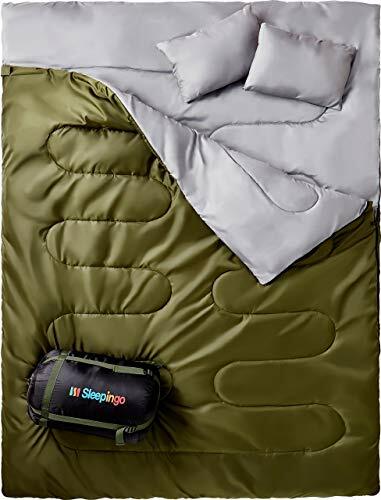 If you want something that’s light but also manages to keep you warm in temperatures as low as 30°, Sleepingo has the sleeping bag you’ve been waiting.